If the American Dream is achieving success through a combination of hard work, talent and opportunity, military veteran Martin Rowe is the epitome of the American Dream. The youngest of ten children, Rowe was raised by a single mother in 1970s, economically-depressed Cleveland, Ohio. He progressed in his Army career to serve in important posts over three decades: in Bosnia, as part of the 40-nation rebuilding effort after the war; in Guantanamo Bay, Cuba, as part of military tribunals; and in Afghanistan and Iraq, establishing forensic science labs in those war zones. Though he had many successes as an Army officer, Rowe counts his family as his greatest accomplishment. "My most significant achievement is raising a family with my wife," said Rowe, who has been a special agent in the Department of Health and Human Services Office of Inspector General's (OIG) Atlanta region for 17 years. Rowe brought to OIG skills honed in the military to combat Medicare and Medicaid fraud and abuse. Never a kid to focus on his studies, and lacking direction, Rowe dropped out of high school and joined the Army, starting with basic and advanced individual training at the since-closed Fort Benjamin Harrison in Indianapolis. "I was lucky I joined up when I did, during the military buildup in the 1980s. I don't think the Army would take a high school dropout later on" when the demand for recruits tapered off, he said. After basic training, an educator encouraged Rowe to obtain his GED and attend college - life-changing steps for the young soldier. In 1983, Rowe began classes at the University of Cincinnati and joined the Reserve Officers' Training Corps (ROTC). In 1985, he was commissioned a second lieutenant and later graduated with a bachelor's degree in political science. For more than a decade, Rowe served as a military police officer in Korea and at various posts in the U.S. He earned a master's degree in forensic science at George Washington University in 1995 and, in the process, learned crime lab analysis: obtaining and analyzing DNA evidence, fingerprints, examining documents, forensic chemistry and general crime scene processing. He also studied the basics of performing autopsies. "Once again, I was lucky: I was the last officer to go through that program," Rowe said. After Rowe's class graduated in 1995, the Army transitioned to an all-civilian workforce at the crime lab. Rowe next worked at the crime lab at the Department of Defense, serving in the Army Criminal Investigation Command, where he oversaw processing of evidence. In 1999, Rowe deployed to Sarajevo, Bosnia, as part of the NATO Peace Keeping Force, in which more than 40 nations served to find and arrest war criminals and recover mass graves of genocide victims. "I enjoyed working with people from all over the world," he said. Rowe was a technical advisor, overseeing document recovery and identification of bodies at one of the mass graves. When Rowe returned to the states, he got a call from an old friend in the Army Reserve, who worked as a special agent in charge at OIG. The friend urged Rowe to apply for an opening at OIG, an opportunity that appealed to Rowe and his wife, who were growing tired of the frequent moves that come with life in the Army. Rowe moved nine times in 13 years and lived in 12 houses. "By the time my youngest daughter was in first grade, she attended four schools," he said. The prospect of staying in one place was good news for his family. "My last day on active duty [in the] military was December 31, 1999, and my first with [the] HHS Inspector General's Office was January 1, 2000," he said. 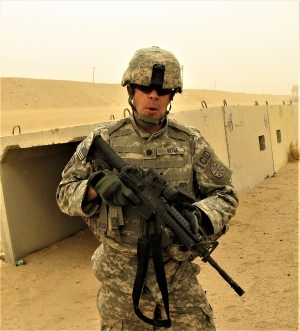 Rowe continued his military career as an Army reservist, continuing to put his critical skills to use. 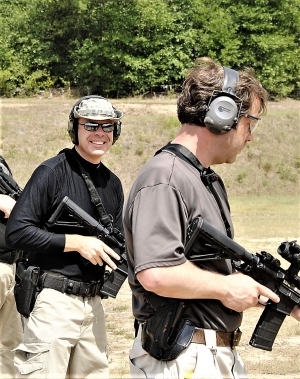 In 2005, Rowe was commander for small arms training at Fort Gillam in Atlanta, "traveling like crazy" to train instructors all over the country. His boss was retired Lt. Gen. Russel Honore', who was also tasked with commanding the military response to Hurricane Katrina in 2005. "In 18 months, our teams and I trained more than 120,000 soldiers on small arms, including new optics and night sights on guns, he said. From 2006 to 2007, the Army was intensifying its forensics capacity, setting up forensics labs. "At the time, the question was: Who in the military has the knowledge to set up a forensics lab? Me. So I got called up to launch this forensics lab," he said with a chuckle. In January 2007, Rowe deployed to Guantanamo Bay to work on the military tribunal that prepared intelligence packages on detainees to be presented to a three-officer panel. "I worked in the prisoner camps and found it interesting to see what decisions and lives led these [detainees] to Guantanamo Bay," Rowe said. The following year, he was mobilized as a commander in Iraq to open four forensic labs. He and his team would examine debris from bombs and other devices used against U.S. troops and look for fingerprints and DNA evidence. "One of the gifts of Saddam Hussein's dictatorship to our [investigative] team was a fingerprint database of Iraq's population. We went to work identifying who made different bombs, and they'd be picked up," he said. "With fingerprints and DNA, we could say [with] 100 percent accuracy, 'This is who is guilty.' And, since the DNA and fingerprint data was not classified, we could share it with the Iraqi court system, and in many cases were able to get persons who attacked coalitions forces prosecuted in Iraqi courts," he added. 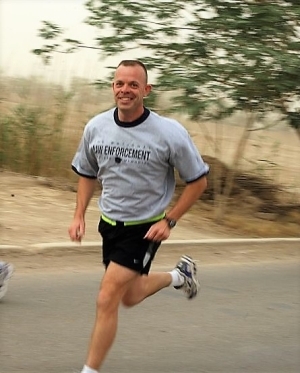 In May 2011, Rowe retired from the Army Reserve and returned to work at OIG full-time as a special agent. "This government job was a relief from the 24-7 pressure of working with the Army" supervising over 600 people to supervising no one, he said. The more manageable lifestyle suited his growing family, too. At OIG, the biggest cases Rowe has investigated involved several Tenet hospitals that paid kickbacks to a company operating prenatal clinics in exchange for the referral of low-income women for Medicaid services. The investigation resulted in a 2016 global settlement of $514 million with the Tenet Corporation, a nationwide hospital chain.